Since quitting back in February, I have been meaning to send out an email to family, family and literally everyone I know, announcing my new business venture. The idea was brought to my attention in an article I read a while back about starting your own business. I wanted to paste that email here and maybe this will help promote Hip-Threads just a little more. Good Morning friends, family, acquaintances, co-workers, and maybe some of you I barely know. 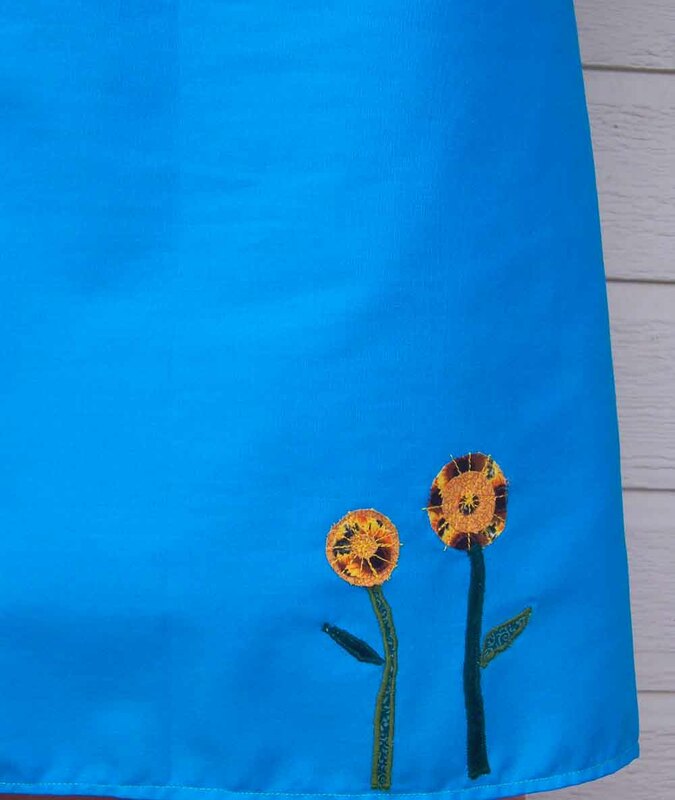 You are receiving this email because I would like to announce that I have taken my home sewing/designing business, Hip-Threads.com, full time this past winter. After a lot of thought, and 6 years of doing Hip-Threads.com on the side, I decided to believe in myself and try to make this part time hobby a full time business! Just as I was about to quit full time work, an opportunity presented itself for me to contract part time (16 hours for 6 months) for the Colorado Central Cancer Registry. This work I do mostly from home and it's been a great learning experience and stepping stone down from full time work. I hope to be able to continue contracting part time after my current job expires. This past winter and spring have been *so* much fun for me; I spend my days sewing, hiking, writing and working at my leisure. This has been one of the best decisions Josh and I have ever made; and I finally feel like I am doing what I was meant to do in life! 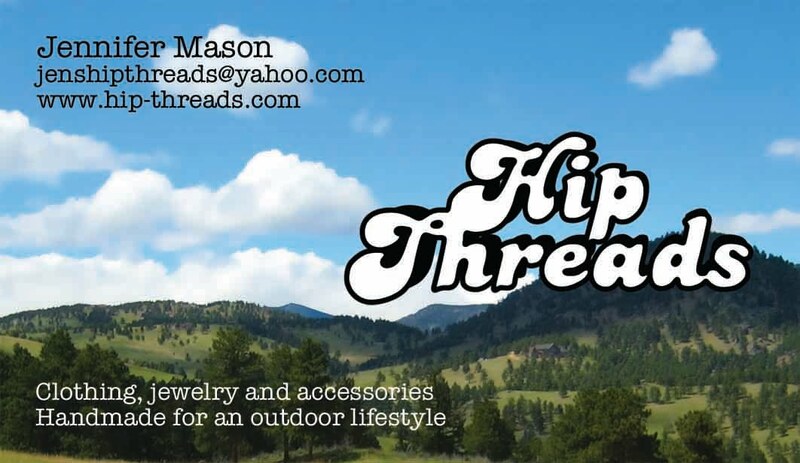 The intent of this email is to share some information about where I will be vending this summer; to give you information about Hip-threads and my business, and how you can help my business grow if you'd like. I am trying to spread the word about my booth in hopes to get a big turnout, so please spread the word about the market to anyone you know who is in the Denver area, or might be traveling here this summer. In my booth you will find handmade skirts, summer sundresses, tank tops, bags, children's clothing, as well as handmade quilted wall hangings with a Colorado theme (great gifts or souvenirs); gemstone necklaces and earrings; handmade greeting cards, hair accessories including headbands and bobby pins. Nearly every single item is one of a kind, and most are made with organic, eco-friendly or recycled/vintage materials so that you can feel good about what you are buying! I also sell my items online, for those of you not in the area. The look of the site will be changing very soon thanks to the help of my friend Jim who has done a lot of work to help design and create a more user friendly website. You can join my mailing list and you will get emails about two times per month when I have updated my website with new items or sales from my regular business email jenshipthreads@yahoo.com. Go to my website and scroll down to enter your email in the box or you can also just reply back to this email and let me know if you'd like to join my mailing list and I will add you myself. I also sell lots of items in my etsy shop; which is very simple and easy to use if you haven't tried before. Etsy is a website that sells only handmade items. To do this; go to the link above and if you are not a fan yet, you should see a gray "like" button at the top of the page; click it. You can also share Hip-Threads with other facebook friends. To do this; go to my page and under my photograph there is a link that says "suggest to friends" click this and all of your friends will pop up in a box. You can suggest my page to all of your friends and they will get an email with a link to check out my site. I'd really like to hit 500 fans by the end of the summertime; I have 316 fans today. One last thing that I could really use on facebook is "fan photos." 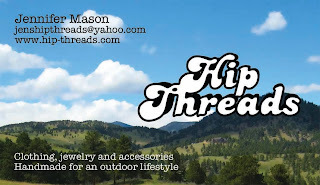 If you own a Hip-Threads item, whether it's clothing, jewelry, or whatever; take a photo of yourself in the item and upload it to my facebook page. To do this, to go my facebook page, scroll down and on the left side there is a box under my photo albums that says "Fan Photos". You can upload a pic of yourself in your Hip-threads item there; I have none as of right now...who will be the first? Maybe you know someone who might be interested in hiking, or who is visiting the area, please send along the above link! I have been writing in this blog since 2007 and recently transferred it over to a new host. The posts go really far back starting with our 2007California trip. When my new website is open, the posts will also be on the blog section of my homepage. You can follow either of those blogs by clicking the gray "follow" button on the right side of the page. 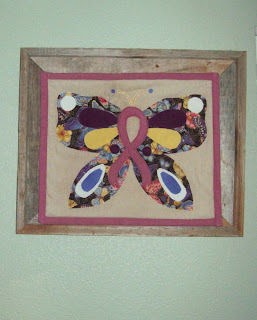 As a big thanks to all of you who read this far; please accept 15% OFF your first entire purchase at Hip-Threads in 2010! This can be used either on my website or in my etsy shop or at my Farmers Market Booth. If you would like to use it online; please email me with what items you'd like to purchase and mention "welcome email" and I will discount your purchase. Or if you would like to use it at the farmers market, please just mention the "welcome email discount" and I will give you 15% off! Again, please share this email or any of my websites with anyone who you think might be interested. I'd greatly appreciate it! The spring just flew by and farmers market season is nearly upon us! Eep! I am *not* ready! Despite the countless hours of sewing, beading, cardmaking, etc...I still am not done creating items nor have I bought everything needed to display my items. (clothing rack, tables, hangers) This is causing me to stress out just a little bit :) I really need a helper, and have asked some friends for assistance; last week I made cards with the girls and next week I am making necklaces with Heather. Next week I really need to gather everything together and set up a display, see what I have and need. Hopefully this will help me feel more organized! 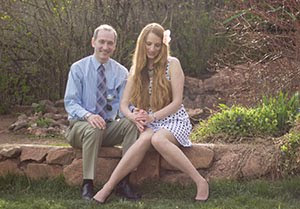 I am also hoping to have a new website published before the farmers market; my friend Jim is making it for me. I am really grateful for his help, and I really hope it gets done before the market starts. However, in all of my stress, I am still a lot happier doing what I love each day rather than going into an office. I still get a little excited and giddy when Sunday night comes; and I think, "I don't have to fret about Monday, because I don't have to go to work tomorrow." It's a great feeling. This weekend I had been hoping to go camping and get away from all the stress and work for a few days. Unfortunately, Josh has come down with a really, really nasty cold and it's not looking promising to leave tomorrow like we had planned. Maybe we can shoot for Saturday morning. Happy Memorial Weekend and Summer Solstice! Ideas and inspiration. Where does it come from? I have mentioned many times in this blog that I have some incredible girlfriends that I am very grateful for and those ladies come up with great ideas for my business. They are my "idea fairies." Often, I will come to our weekly girls night with an idea or a vague thought about something to make and they will run with it, coming up with a brilliant idea for me to create! This year I have been trying to come up with some new ideas for the farmers market booth, but I wasn't coming up with anything that I really liked. 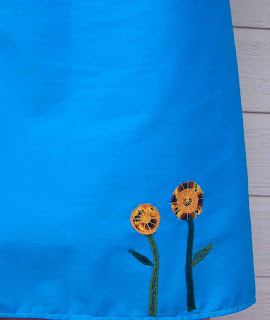 I have been so busy this spring getting ready for the market; sewing skirts, bags, making jewelry and cards and other small items for the booth. But I still needed something else, something for the home, maybe? I decided to email my mom and my sister, two other creative ladies in my life, and see what they thought about all I had done to prepare for the market. Maybe they would have a suggestion or idea, or notice something I had missed? A few days later I received an email back from my mother; who reminded me of the wall hanging I had made for them, my grandparents and my mother in law for Christmas in 2008. Everyone loved the wall hangings and she thought I should make more. About a week later, my sister finally emailed back; she made some suggestions, then near the end of the email she says the wall hangings are a good idea; "maybe you should make wall hangings of Colorado landmarks?" (light bulb goes on over head *right now*!) Why hadn't I thought of that? What a great idea! Colorado landmarks for the Denver farmers market! Yes, perfect! This week, I have excitedly stitched up three wall hangings with the Colorado Continental Divide image on it; which is also the picture on the CO license plate. Next, I will cut out some with the Denver skyline both looking east and west with the mountains behind it. 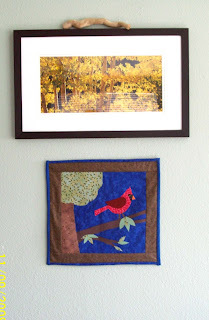 The wall hangings don't take me very long to make, except for one detail that nearly doubles the time on each wall hanging, the binding! Why isn't there a better way to bind a quilt, besides hand stitching it, lol? I hope to have at least 10 of them done before the market; hopefully they will be a big seller because I really enjoy making them! Thanks so much to those idea fairies who help me to be creative, I couldn't do it without you! /I was really excited to bring our new netbook on vacation; I wanted to blog from the beach and share my adventures along the way. Unfortunately, The Hilton Hotel we are staying at charges $15 per day for their internet; so I have been browsing for unsecured wireless all morning, but finally found one that stays connected; thank you hotel next door! It has been years since I have been to Florida; Josh and I came here back in 2002 to visit my grandparents and go to Disney World and then we moved to Colorado and haven,t been back since. It's great to be here again! This morning we have been laying around the pool, reading, getting sun, swimming, and blogging...what a life! It makes me want to move from the mountains to the beach; from hiking boots to a bathing suit. But I think I would miss my hiking trails too much and I don't know if you can hike much through the Everglades. I think its about time to take a walk down the beach now....fun in the sun!